Check-out how easy it is to number a ticket with a perforation (2 numbers). This video shows how the Pyxis Imposed logic module simplifies numbering repeat jobs. 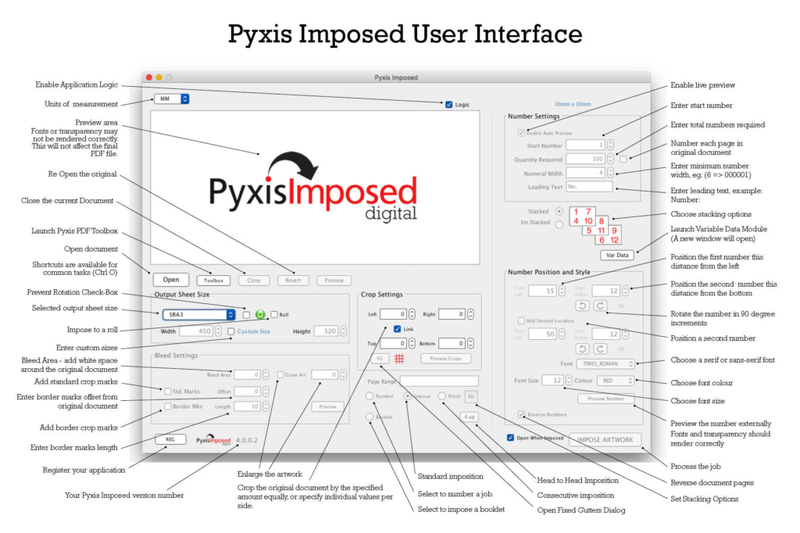 Pyxis Imposed can now automatically reduce unnecessary white space via its Logic Module. Easily convert images to custom size PDFs with desired quality setting. Professional booklet imposition is incredibly fast and easy with Pyxis Imposed. You can now import a pdf and impose it in just one click! The application automatically reduces the bleed area to fit the maximum number on your output sheet. And it will rotate the sheet for best fit. If you are numbering a job, simply place the number visually on your PDF. Pyxis Imposed will automatically figure out how best to lay them out and even place the numbers in stacked reversed order for fast finishing. But there’s much more . . .
Pyxis Imposed is fantastic, it’s great and it does exactly what it says on the tin. I am a Pyxis user for two years now, I love Pyxis Imposed, I use it a couple times a week for numbering and it works great. Pyxis Imposed works so well, I love it . .
We love Pyxis Imposed here at Digi Print, we are 100% happy with it, its fantastic, brilliant for numbering. I haven’t heard any complaining from my staff regarding Pyxis Imposed! So it must be doing the job. It works great here for us at Harvest Moon. Follow this link to check-out the many features of Pyxis Imposed. Click this link to be taken to the FAQ page.